An historical exploration of the causes which led to the current spiritual vacuum in British society. In this essay, I am going to explore some of the causes which led to the opening of a “spiritual vacuum” in Britain, starting with the rending the of Christendom under the Henry VIII during the 16th century, and the innumerable ramifications that continue to affect the British national consciousness in the present day. The unbiased reader must acknowledge that the Catholic Church, in spite of many failings of her members, has been a source of much good in the history and development of mankind. She was a major source of preserving order and learning after the collapse of the Roman Empire, and integral in the rise and development of Western Civilization. Since it was separate from any governmental organization that sprang up, it also served as the potential conscience of those government systems. It was a spiritual power, distinct from the temporal powers of given countries. It provided a cohesive front for Christendom, welding together many feudal states into one civilization. The Reformation in its full-blown state was not a “reforming” movement, but rather a revolt ... It did not seek to refurbish the house, but rather pull it down from its foundations. The division of Christendom started out as a reaction against the corruption that had entered the Church due in large part to the temporal power assumed by the clerics. However, the Reformation in its full-blown state was not a “reforming” movement, but rather a revolt. This is something that both Catholic and Protestants should be able to agree on today, simply based on the historical reality. It did not seek to refurbish the house, but rather pull it down from its foundations. It did not seek to go for marriage counseling, but declare a bitter divorce. But instead, these would-be reformers attacked and rewrote doctrine, and as such set themselves up in opposition to the Church Magisterium. It was a declaration of war against the unity of Christendom. It was challenging the very bedrock of their civilization. Of course it was bound to have political repercussions, and the generators of the revolt expected no less. What they did not expect was that their fiery, often sincere convictions would open the door to spiritual lukewarmness across Europe and the world through the political domino effect. Nowhere was this more obvious than in England under Henry VIII (reign: 1509 – 1547). By establishing the Church of England, he essentially assured that the religion of the country would be a religion of nationalism. It was not a matter of moral convictions, but political convenience. 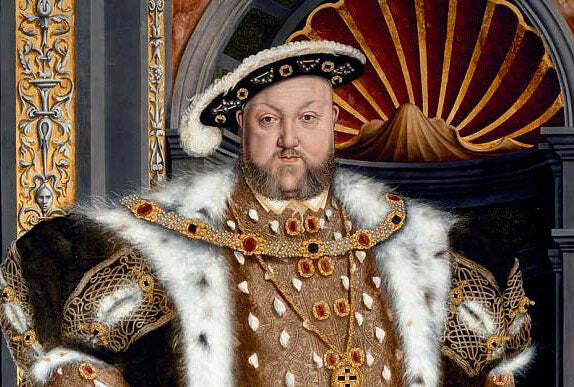 His desire to his wife, Catherine of Aragon (who failed to produce a male heir), annulled, and marry his hoped-to-be fertile mistress, Anne Boleyn, was the driving force behind the fracture…even though he would later have Anne beheaded on a trumped up charge after she too failed to produce a male heir. In spite of this, Henry himself remained a doctrinal Catholic in all but Papal supremacy and had not intended any major change in overall belief within his kingdom. But his power-hungry actions were one step down a slippery slope. The dissolution of the monasteries, using their wealth to fill the king’s coffers and their lands to reward the king’s high-born henchmen, was a visible sign that the spiritual powers in England were being forcibly absorbed by the temporal. Under Edward VI (reign: 1547 – 1553), Henry’s surviving son who was dubbed by the Protestant faction “the English Josiah”, a doctrinal shift took place in favor a low-church Protestantism, complete with a full-scale “stripping of the altars” and the rejection of such things as Transubstantiation, the Communion of Saints, Marian Devotion, Priestly Celibacy, etc. Through these acts of removing the visible aspects of religious ceremony so distinctly Catholic, they were setting the stage for secular ceremony to take its place for the Protestant populace. Under Queen Mary I (reign: 1553 – 1558), the Catholic daughter of Henry and Catherine of Aragorn, an effort was made to bring England back into the fold of the Catholic Faith and heal the schism of her father and reverse the heresy of her brother. But in a land of split allegiances, her burning of heretics, although not unusual considering the brutality of the era, attracted negative press. This was compounded by her marriage to King Philip of Spain, who seemed more interested in using England to bolster his own continental ambitions as opposed to being a proper support for his wife. In the end, Mary died broken and betrayed, her well-intentioned plans having backfired miserably. Next came Elizabeth I (reign: 1558 – 1603), the daughter of Henry VIII and Anne Boleyn. Imprisoned by her sister Mary for suspected plotting, she was ambitious, clever, shrewd, and determined to reign and rule a queen. She was also unmarried and unattached to anything that might check her power. Elizabeth had lied to her dying sister and promised to uphold the Catholic Church, but upon ascending the throne quickly reneged and claimed the title Head of the Church in England. Although she said she would not “look into the windows of men’s souls,” this was nothing more than a ploy to avoid to the bad publicity that haunted Mary. Steps were taken to eliminate Catholicism within her realm, making the Catholic priesthood a crime punishable by banishment or death. Those who hid priests or were caught attending Mass were susceptible to the same punishment. When Pope Pius V excommunicated Elizabeth, the persecutions against Catholics in England and Ireland grew worse. At the same time, Elizabeth tried to enliven the newly cemented Anglicanism by preserving some of the “smells and bells” of the old faith, introducing a new and powerful secular element to give religious fervor to the project: Nationalism. This was the age of the Sea Dogs, pirates for Queen and Country, whose anti-Catholicism was unleashed upon the prosperous Spanish colonies in the New World. Their razing and pillaging earned them infamy, but since England had set itself apart from the rest of Christendom and their religion was in effect England herself, the rules of the high seas mattered naught and could be easily absolved by the Head of the Church, Queen Elizabeth, who was more than happy to knight their leader, Sir Francis Drake. All this did nothing to smooth out relations with Spain, which sought to rid themselves of a thorn in their side. The result was the launch of the Spanish Armada, which ended in total disaster for the Spanish. This elicited a sigh of relief from almost all of the English, Protestant and Catholic alike, who still cared enough about their country and culture not to want any “Spaniels” ruling the roost. The Black Legend began to be cultivated, painting anything Papist as perverted and superstitious, the opposite of everything Englishmen wanted to be. The propaganda seeped in thoroughly, and after the death of Elizabeth, new divides took full shape within the Anglican Church, between those who were closer to Catholic practice and those who were further afield. Under James I (reign: 1603 – 1625), the first Stuart king to rule England and Scotland, factions such as the Puritans and Separatists either wanted to purge or separate the Anglican Church because, in their opinion, it was still far too Papist. They, too, faced persecution, convincing many of them to leave the country and found settlements in the New World. But they needn’t have worried about their king being a Catholic-lover. The Gunpowder Plot of Guy Fawkes and his fellow disillusioned Catholics certainly didn’t improve his opinion of them, and this attempt to blow up the king and parliament assured that James would continue the persecution begun under Elizabeth, even though his own mother had been the very Catholic Mary, Queen of Scots, from whom he had been taken as a baby by the Protestant Lords in Scotland. But it was in the reign of James’s son, Charles I (reign: 1625 – 1649), that the factions within the Anglican Church exploded in full light. Charles, although still anti-Catholic, was much more sympathetic to a high-church form of worship, and tried to force it on low-church sympathizers in Scotland and England. This was one of the main triggers of the English Civil War, a bloody contest that ultimately resulted in the overthrow and execution of the king and a Puritanical government that devolved into a police state bent on enforcing personal morality. It was also during this time that Oliver Cromwell led his army into Ireland and, fueling them with exaggerated stories of atrocities committed against Protestant settlers by Irish rebels, wiped out or sold off half of the very Catholic population. When the monarchy was finally restored under King Charles II (reign: 1660 – 1685), the morality and religiosity of the court and country, which had been brutally enforced under Cromwell, collapsed in a heap. It was as if after breaking off with the rest of Christendom, the people of England had a hard time knowing whether to be religious fanatics or amoral derelicts, or perhaps a little of both! While some good Protestant clergymen certainly try their best to make their influence felt positively, there was little real religious authority left to lead the flock. Everything was an experiment, and every time something went afoul, a new one was struck up lickety-split. But one thing could be counted on: if something really awful happened, the Boogie-men Catholics could be blamed. Such was the case with the great fire of London, unleashing a new wave of hatred against the small body of Catholic recusants left. King Charles shocked his kingdom by following the lead of his brother and converting to Catholicism. Then that very brother, James II (reign: 1685 – 1688), inherited the throne and proceeded to try to give religious freedom to everyone involved so as to free up his fellow Catholics being persecuted. The very anti-Catholic population went bonkers. James handled the situation badly, responding haughtily to critics and banishing or imprisoning them for refusing to bend to his will. When his infant son James was born, and baptized a Catholic, the parliament decided they had had enough and invited his son-in-law, William of Orange, to come over from the Netherlands and seize the throne. The soon-to-be-crowned William III (reign: 1609 – 1702), a Dutch Calvinist who was ironically allied with the Papal States against France at the time, agreed to take up the offer in order to secure an English alliance. He proceeded with a letter of Papal support and an army stacked with Catholic mercenaries, while Masses were said for him back at the Spanish Embassy in the Netherlands. But of course the Whig historians preferred to overlook those minor details, and instead focused on his successful invasion and overthrow of his father-in-law as a purely Protestant triumph. During the subsequent reigns of Queen Anne (reign: 1702 – 1707), the four Hanoverian King Georges (reigns: 1707 – 1830), and William IV (reign: 1830 – 1837), religious life in Britain took a downward spiral. Everyone was sick of religious infighting, and just threw up their hands with almost all the experiments except a lukewarm, state-run Anglicanism that was usually more a matter of social status than religious belief. Certainly, there were still those devout Anglicans who did take their religion seriously, including King George III (reign: 1760 – 1820), but they seemed to be the exception instead of the rule. Indeed, the spiritual vacuum was opening ever wider, creating an apathetic society that gradually became more dependent on nationalism for its identity. In the British military, a moving microcosm of British society, religion sunk to an all-time low. Much of this was because upper-crust Anglican chaplains tended to be out of touch with the men, and were there only to provide some sense of outward structure. But few were willing to put their lives on the line for their men, and viewed it as merely another job for a salary as opposed to a mission for the salvation of souls. Of course, there were exceptions here as well among Anglican and other Protestant ministers of the gospel. But again, the problem remained, because the clergymen were seen as merely another wing of the secular authorities. In response to the obvious, more splinter-off groups sprung up in the 18th century in order to rekindle the flame of religious fervor, including the Methodist movement of John Wesley who made all the world his parish. At the same time, the laxity in views on religion that came with the Enlightenment also enabled a broadening of religious toleration, which paved the way for Catholic Emancipation Acts to be passed through Parliament. This provided those with Catholic sympathies freedom of expression, and in spite of continued anti-Catholicism among the population, gave rise to the Oxford Movement in the 19th century. But with the widening of Empire under Queen Victoria (reign: 1837 – 1901) came the full blossoming of that jingoism that equated religion with the state. As the Sea Dogs had found it convenient to commit crimes in the name of Queen and Country, so did many war-mongering imperialists. Atheism, if followed to its logical conclusion, is an embrace of cynicism, and as such, never fills that emptiness within the human soul. As the years passed, the nation of Britain became more intrinsically linked to her empire. The supposed superiority of the British system became the new religion to be spread to the four corners of the earth. However, the glory days of empire began to lose their sheen. Two world wars changed the landscape of the national consciousness, and when the empire began to collapse, the country gradually lost its sense of identity. With this loss of national identity came the reopening of the spiritual vacuum that British nationalism had previously filled. Also, even the loose trappings of religiosity began to fall apart, as out-and-out atheism came into vogue. But atheism, if followed to its logical conclusion, is an embrace of cynicism, and as such, never fills that emptiness within the human soul. Another ingredient must be sought out and found. Recently, a new form of nationalism has risen like a phoenix from the ashes of cynicism and disillusionment with church and state, taking on attributes that tap into some deeper spiritual longing. British nationalism is now old hat and considered repugnant, but are we not seeing a rise in Celtic nationalism, frequently accompanied by the same negative qualities of self-proclaimed superiority and isolationism? It also thrives on making a pseudo-religious cult out of a secular state, with the ideal of localized independence its dogmatic creed and a supposed instant fix for the problems of daily life. For many, these old, repackaged ideologies appear to be a spiritual oasis in the midst of the dryness that has settled over the whole idea of Britain like a desert storm. The root of this desperation to find fulfillment can be traced back to the false concept that any secular state can take the place of religion, or that any secular ideal can replace God in the human psyche. It never can. The root of this desperation to find fulfillment can be traced back to the false concept that any secular state can take the place of religion, or that any secular ideal can replace God in the human psyche. It never can, although such an attitude is often portrayed as wonderfully intellectual and modern. It is the pinnacle of Humanism, and that is its folly, for Humanism as a religion is merely inward-gazing self-acclamation. It always fails to satisfy. That is why these infatuations, like the ones that went before them, are ultimately doomed to crumble. The nature of their foundations assures it. Such is the tragedy that will continue to repeat itself if the British people do not rediscover the importance of their own religious roots and reach for some transcendent reality that probes the depths of desire and understanding. Paradoxically, if they wish to save their country that they once worshiped and that sorely let them down, they must cease to make it the center of their universe. They must look to God as their top priority, and all other elements will fall into their rightful places, avoiding love-hate extremes. One must not worship one’s nation, nor make it their religion. They must not put her on so high a pedestal that she will topple and fall. We must expect imperfections, and learn to deal with them in love and true patriotism, through the grace of God who will never fall short of perfection. I have always maintained that beneath the surface, the Brits with their pomp and ceremony and constant spiritual searching are still cultural Catholics. I still maintain it. In days of old, they were one of the most Catholic parts of Christendom, called “Our Lady’s Dowry.” The pillagers of the past may have become disgusted with the corruption of Catholic churchmen and the abuses in practice, but their constant experimentation has left nothing new in way of purifying fallen humanity. Rather, it has created a series of further disillusionment and deceptions. In an atmosphere of uncertainty over the future identity of the British Isles, perhaps it is now time to look to the English Martyrs and remember their sacrifices. As St. Edmund Campion said, “So the faith was planted; so it must be restored.” He was speaking of the hearts, minds, and souls of the British people, who I will never cease to pray will again discover that Christ alone is worthy of adoration, and that His gift of the Catholic Church is a true home for all spiritual pilgrims in search of that all-consuming love that transcends earthly goals and expectations.